This week Valve ran a series of timed announcements around the theme of expanding their game distribution platform into the living room. It’s a publicity stunt designed to generate hype; people were encouraged to let their imaginations run wild speculating on what Valve might do. As it happens Valve announced three things: an operating system, a series of consoles and a controller. SteamOS is going to be a Linux-based operating system which is going to do everything that the Steam software already does, along with a few bonus features. The most important of these features is the ability to stream games from a Windows computer. Given that most games are still Windows based, the performance of this feature will be a deciding factor in the success of the console. However, there’s some potential in building new games for the system. Most of today’s game engines now have cross-platform support, and some indie developers are moving away from Microsoft platforms. They mention in the FAQ section that it’ll be open source, and even free to download, but I doubt it’ll be free software. Think of it as ‘Android for games’. Valve want specialised hardware which will run SteamOS. However, they’re not making all of it themselves, they’re just making a prototype console, and they’ll work with third-party manufacturers to make other consoles. The good thing is, if you don’t buy a ‘Steam Machine’ you can still take your games on Steam and play them on whatever other Linux/Windows/Mac computer you already have. The ‘push into the living room’ doesn’t necessarily mean a pull out of the current desktop gaming environment in your office. This announcement is the least clear on details. There are no photos and no specifications. 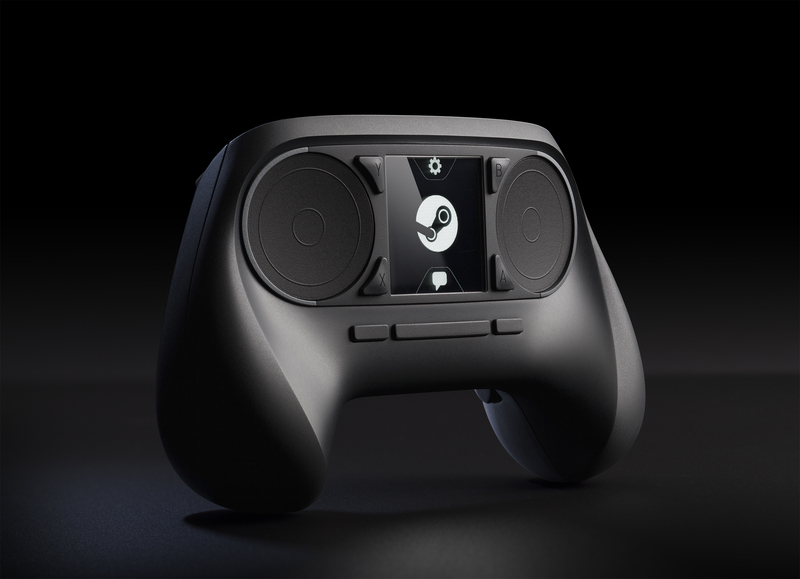 Valve’s prototype will be tested by an open beta in which 300 people will win consoles. I think when this happens it’ll be followed up by quite a bit of media attention and the testers will be able to give us some insights on what a future ‘Steam Box‘ might look like. Unlike some predictions they didn’t announce Half-Life 3, they announced a new controller. Ah well, we can always dream. It looks like they’ve tried to make a cross between the Wii U controller’s touchscreen and the smooth design of the Xbox 360 gamepad. They’re stuck in the old debate between PC and console FPS players over the analogue stick which gives greater control over movement; and the mouse which gives greater precision on aim. They compromised on both counts and arrived at touchpads instead. It’s a radical choice, though not that surprising as Valve have a history of supporting weird and unorthodox controllers. They also note that the controller can pretend it’s a keyboard and mouse for playing old games. At it’s simplest you can map WASD to the left touchpad, mouse aim to the right touchpad, and left/right clight to the left/right bumpers. It’s part of the same testing program as the Steam Machine prototype and I look forward to seeing how it performs.